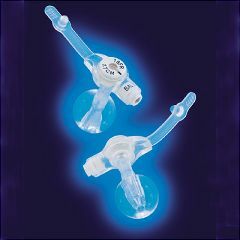 The Kimberly Clark MIC-KEY Low Profile Gastronomy Feeding Tube features medical grade silicone construction, low-profile design, tapered distal tip, silicone internal retention balloon, distal tip recessed at 5 ml, proximal anti-reflux valve, SECUR-LOK® extension set connector mechanism and radiopaque stripe. Gamma sterilized. The Mic-Key Feeding Tub is unobtrusive and easy to conceal. Minimal external surface area allows air circulation around the stoma. Ease of care encourages patient involvement and self-sufficiency. Lightweight. Safe. Ease of use. Good quality brand,very good price. This g-tube is for mom. I replaced my wife older g-tube with this in just minutes. Very easy to work with. The Mic-Key is keeping me alive. Easy to use. Sturdy. Safe. My son currently has a 20 fr 2.5 cm mic-key, He has used a feeding tube since 2001. It just recently started leaking, a lot.The dr said she was going to order a slightly larger mic-key to see if that stops the leaking, and she said it was 18FR 2.3 cm, my question is.. isnt this a smaller size? Do you need a prescription to purchase the mic-key low profile feeding tube? MY LOW PROFILE TUBE, A 20F 4.5CM SIZE RETRACTS INTO THE HOLE, AND STAYS THERE. I HAVE TO DEFLATE THE BALOON AND IT POPS OUT. THIS HAPPENS SEVERAL TIMES A DAY, BUT USUALLY POPS OUT BY ITSELF. I HVE HAD THE SAME SIZE FOR SEVERAL YEARS WITH NO PROBLEM. WHAT IS CAUSING THIS, AND I RELIEVE THE PRESSURE BY VENTING IT THE PRESCRIBED WAY. MY WEIGHT STAYS THE SAME. SHOULD I GO TO A LONGER SIZE? Do you send this product to Brazil? My cousin lives there and he needs 2 for his son. Thank you! I have an 18 french, 3.5 cm installed. I will order a 20 french 3.5 if the size difference is very small. What is the difference? Also, Is this a complete kit? The 18 and 20 FR is the size of the tube your feeding goes through. If you don't put anything but your liquid feeding in your tube you might be ok. The 20 FR is going to be a little larger in the circumference(roundness) of the extension/feeding tube. This may have some bearing on the rate at which your feeding goes into your stomach or the thickness of the feeding going through your tube. i.e. liquid vs puree and meds with sugar/sweetner which can stop up your tube and ruin your syringe after one use. The 3.5 cm is the length of the tube going through your stoma/stomach and where the balloon is attached. If your stomach gets real puffy at the stoma from gas and/or feedings you may want to check with your doctor. This is an indicator that the tube in the stoma may be too short and will constantly irritate your stoma. The complete kit (Gastrostomy Feeding Tube) contains everything you need to insert your new stomach tube, and is a lot more expensive than just the Bolus "Extension" Tube. We should be able to ask our doctors these questions, but I'm finding they don't want to deal with you once your tube is initially inserted!